Posted in Healthy Home & Garden on April 13, 2012. Last modified on February 21, 2019. Read disclaimer. April 17, 2012 - We're masters at the lazy man's method of composting: dig a hole in the garden, throw in the day's veggie scraps and cover 'em up. We cut a thin layer of the dead cells off the bottom of each, and planted them shallowly with the cores just an inch or two into the ground. We've been watering these very well each day. It took only a couple weeks before each of the cores grew a wonderful head of leaves -- though the stalks don't seem to be growing much so. 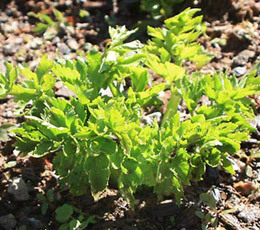 The photo below on the left is how a typical plant looks at the 30-day point. 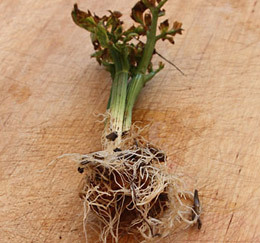 I uprooted a couple of the celery cores today and each is growing 5 or 6 root tentacles, shown below on the right. (It's little wonder why the celery butts have to be watered well every day with so few roots developing). See post below for update. May 28, 2012 - Our attempt at planting celery cores is working wonderfully. We initally planted about 16 recycled celery butts/cores (read initial post, above) and the majority are doing great, though they look more like mini bushes than celery plants (below left). 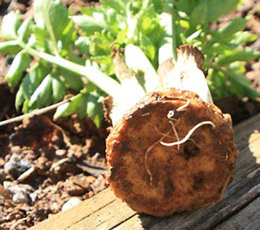 2 or 3 of the celery butts dried up within the first few weeks and after a couple months, one or two more shriveled up and died even though the roots looked strong (below right). 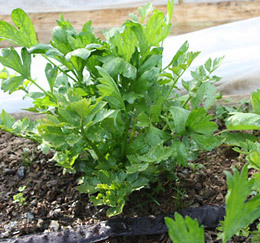 Apparently, planting old celery butts is never going to yield great celery stalks (our's are short and very skinny) but we have an abundance of big, tasty leaves which is exactly what we wanted for smoothies and salads. April 1, 2012 - 12 years ago we ordered a couple 10 pound bags of daikon radish seeds from Tiensvold Farms for indoor sprouting. Now, just a couple weeks ago, we happened to stumble over one of the unopened bags. We weren't certain about the viability of seeds this old so we threw a cup of them in one corner of the garden and within a couple weeks it was a thick, solid bed of delicious sprouts that we've been enjoying in salads (at right). What a treat -- since the lettuce won't be ready for picking for a few more weeks. One thing surprised us, however: radishes are normally pretty frost resistant. Before a recent freeze (mid 20's F), we covered the garden and the only thing with frost bite the next morning was a good sized chunk of the daikon sprout patch. 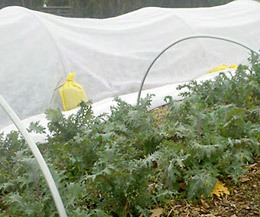 March 15, 2012 - Hoop houses for frost protection are common but did you know that they can double as an organic way to protect the garden from insects? Before the bugs emerge this year, we're planning to roll out Agribon AG-15 insect control garden cloth. According to the specs, this cloth lets 90% of the sun's rays to pass through -- but none of the stickin' stink bugs. We could have tried flexible pvc piping for the hoops but the folks at the Warren Wilson College farm seem awfully smart and they use conduit piping (at left) and a 4' Row Cover Quick Hoop Bender. Come late fall, when we need frost protection, we'll swap out the lightweight insect cloth for a heavier variety. I loved seeing how you reuse the old celery. 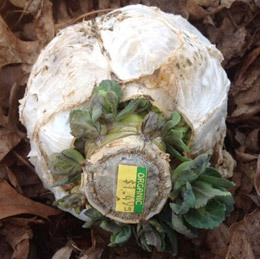 I've emailed you a photo of a head of cabbage I found in my "over-winter" compost heap. Any idea what I could expect if I plant it? Do you think I should bury the whole head? Thank you. Thanks for your message and for emailing us the photo. I've attached it here for all to see... and to hopefully offer comments or suggestions. Personally, my only experience with recycling expired produce involved celery but this cabbage idea looks awfully interesting. Even though this is an old comment thread, it turns out that 'yes! 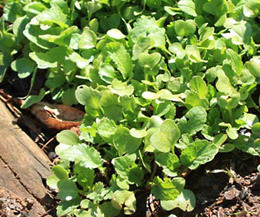 you can replant old cabbage cores.' 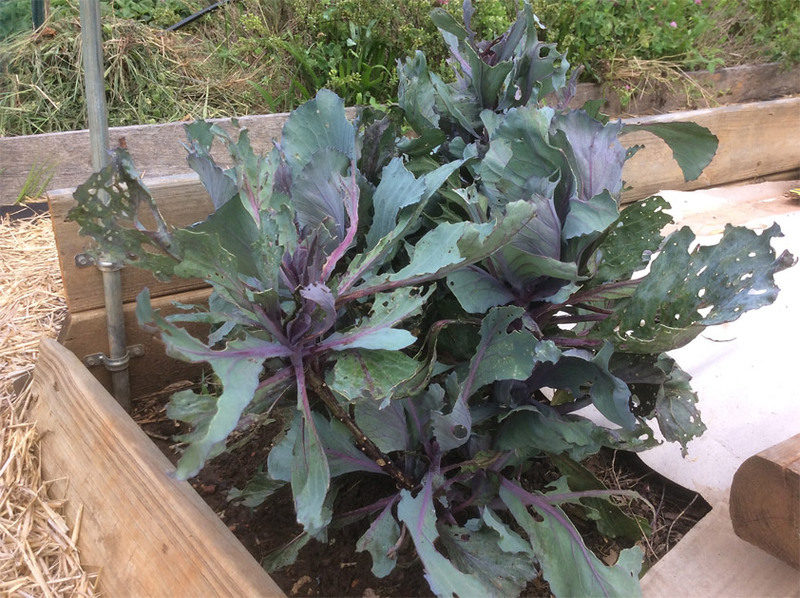 It is now mid August so this cabbage plant looks a little rough -- but we've been clipping from it all summer. It grew out of an old cabbage core we found in our fridge that I plugged into the garden this spring. Do you know if there are safety concerns associated with using pressure treated wood for the sides of raised garden beds?